Imagine a world in which Jewish children not only have strong Jewish identities, but their passion and enthusiasm for Judaism is accompanied by fluency in the texts and practices of Judaism. Imagine a world in which these children grow into adults who can sustain, participate in, promote, and teach a vision of Jewish life that is meaningful and compelling. If Jewish education is to be successful we must have a clear definition of the fluency we are striving for as well as roadmaps of the content, skills, and dispositions that should be taught in order to get us there. 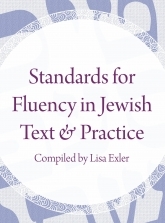 Hadar’s Standards for Fluency in Jewish Text and Practice, developed in partnership with Beit Rabban Day School, is a ground-breaking educational resource that articulates such a vision for fluency in Tanakh, Torah She-Be-Al Peh, Tefillah, and Jewish Practice, anchoring Jewish education in a shared framework of substance and standards. Inspired by the Fluency Standards, Hadar and BimBam worked together to create four animated videos narrated by Rabbi Tali Adler. We hope you find something exciting in them you'd like to share! Please click here to open a taste of the fluency standards. To gain access to the fluency standards in full, please complete the form below.